If Miuccia Prada sees a vintage designer jacket that she likes, she can copy it. She can even replicate it exactly and call it a Prada. Illegal? No. And yet, if Michael Lewis included a page from another writer’s book, he would be accused of violating intellectual property rights. A jacket and most other clothing cannot be copyrighted because they are “utilitarian”. A logo on the jacket can receive copyright protection but not the jacket or blouse or coat or shoe. Writers of jokes, designers of furniture, and inventors of autos also find it tough to secure protection. Where are we going? To intellectual property rights. 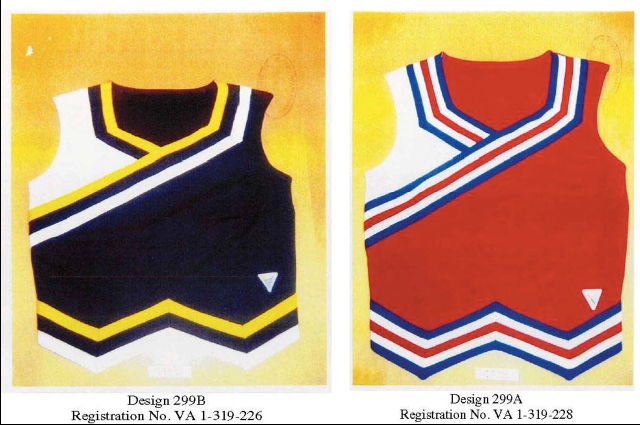 The Supreme Court now has to decide how much of a cheerleader’s uniform is “utilitarian”. If the whole uniform is “utilitarian” then its main manufacturer, Varsity Brands, will lose its copyright. From their competitors’ perspective, utilitarian refers to a uniform that is functional. It needs, for example, the zigs and zags and chevrons that make the wearer look slimmer. The Varsity response involves federal law that says a copyrightable image should be able to exist independently as “pictorial, graphic or sculptural works.” The courts have said that Louboutin can stop others from using a red sole on a shoe. Or that a Mondrian painting on a St. Laurent dress represents intellectual property. Varsity claims that it too owns its design. So, the question is whether the design on the cheerleader’s dress is equal to a painting. The Supreme Court will let us know their decision in several months. Our basic issue is “size.” How far should an intellectual right extend? If it is smaller, then fashion knockoffs multiply. On the other hand, a broader right can be an incentive to innovate. If you know you can profit, then the risks of innovation make more sense. The debate over intellectual property rights goes way back to Alexander Hamilton. Convinced it would foster invention, protect infant industries, and thereby stimulate economic growth, as Secretary of the Treasury, during the 1790s, Hamilton promoted a patent system. I suspect he would have supported broader protection. My sources and more: The NY Times had a good summary of the case as did the SCOTUS blog and WSJ. However, if you just want one source on the bigger issues, I recommend this TED talk on fashion. Please note that several sections of this post were first published in a previous econlife.